Video Podcast: Journey with Us to the Adventures in Odyssey Live Show! 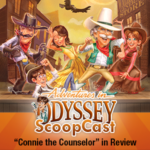 VIDEO PODCAST: Journey with The Odyssey ScoopCast as podcast host Kevin McCreary chronicles his travels to Adventures in Odyssey’s 25th Birthday Bash celebration and live show in Dallas, Texas. He meets up with co-host Garrett Vandenberg for the first time and attends the live recording of an Adventures in Odyssey episode. Plus, go behind the scenes as the we interview other Odyssey fans, cast and production crew. It’s a video podcast celebration you won’t want to miss! Features appearances by the Adventures in Odyssey cast and crew and some unexpected surprises. We count it a privilege to be able to team up with our creative and talented podcasters: Kevin McCreary and Garrett Vandenberg. Our goal remains as true as it was when we started in December 2000: to provide the Scoop on Adventures in Odyssey, one cone at a time. Kevin and Garrett have been such an asset to the team! 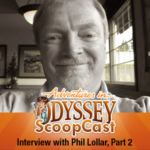 Click here to watch the latest video edition of The Odyssey ScoopCast.